USB Type C connectors, often called USB-C, are small and thin in shape, and have a symmetrical and oval appearance. They're different from previous Universal Serial Bus (USB) types in more ways than just appearance. 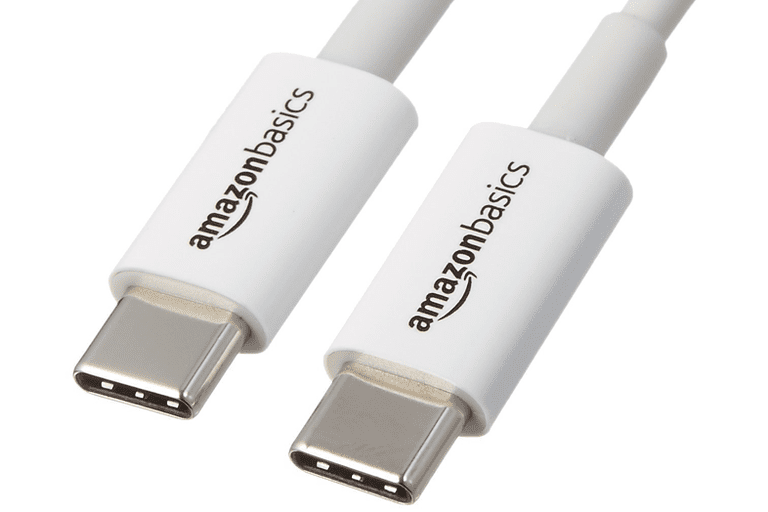 One major difference between the USB-C cable connector when compared to USB Type A and USB Type B, is that it's completely reversible. This means that there isn't a 'right side up' way in which it has to be plugged in. USB-C supports USB 3.1 but is also backward compatible with both USB 3.0 and USB 2.0. The USB-C 24-pin cable is capable of relaying video, power (up to 100 watts), and data (as quickly as 10 Gb/s), which means it can be used for not only connecting monitors but also charging high powered devices and transferring data from one device to another, like from a phone to a computer or one phone to another. The standard USB-C cable has a USB Type C connector on both ends. However, for devices that require USB Type C cables, there are USB-C to USB-A converters available that can be used to charge USB-C devices or transfer data from them to a computer over the standard USB Type A port. The cables and adapters used for USB Type C are usually white but that isn't a requirement. They can be any color — blue, black, red, etc. Since USB Type C is relatively new, and not nearly as common as USB Type A and B, chances are slim that most of your devices already require a USB-C cable. However, just like with prior implementations of USB, USB-C will one day be available in all the same devices that we currently see using USB, like flash drives, laptops, desktops, tablets, phones, monitors, power banks, and external hard drives. Apple's MacBook is one example of a computer that supports USB-C for charging, data transfers, and video output. Some Chromebook versions have USB-C connections too. USB-C is also used for some headphones in place of the standard jack, like these ZINSOKO earbuds. Since USB-C ports are not as common as USB Type A, some devices like this flash drive from SanDisk, have both connectors so that it can be used on either type of USB port. USB Type C cables are much smaller than USB-A and USB-B, so they will not plug into those kinds of ports. However, there are plenty of adapters available that let you do all sorts of things while still keeping your USB-C device, like plugging it into an older USB-A port with a USB-C/USB-A cable that has the newer USB-C connector on one end and the older USB-A connector on the other. If you're using an older device that only has USB-A plugs, but your computer just has a USB-C connection, you can still utilize that USB 3.1 port with that device using an adapter that has the appropriate connections on both ends (USB Type A on one end for the device and USB Type C on the other for connecting it to the computer).